......... what is this piece going to be called? We all keep on having to say the Mabley Green Boulder (or the Shoreditch Park Boulder) - can you not give them a short, sharp, snappy name for us to use?! We all LOVE the rock (sorry John - that's what we are calling the Mabley Green one 'til you give us a new name) loads!!!!! It fits in perfectly in the Wick. Thanks heaps for putting us on the artistic map!! PSS: I've just seen the kind of Outdoor Gym that adidas are going to build on Mabley Green. These pics are from their one in Mile End Park. Maybe this will make anyone that's still unsure about how Mabley Green will all look in a few months time - feel better about how it all fits together. Please feel free to add any comment about this blog entry! Simply click ‘comments’ below & you can tell us all what you think. You can use your own name, a pseudonym, be anonymous, or even join blogger yourself. 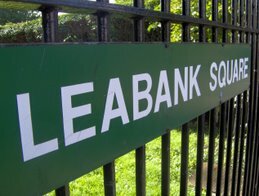 The more we all discuss Leabank Square – the more we all feel part of it!! ..... but is it ART? Sorry everyone, I still don't buy into this boulder idea (even more now than previously). I don't wish to call it a travesty but it looks nothing like the 'Artist's impression' we were presented with, as shown on the 24th June blog. The first point to make is; it's only ½ the height it was indicated to be (even though it also benefits from a plinth with nasty sharp edged corners which wasn't in the original photo), and as the artist was already "in possession" of this piece of Cornish Granite at the time the publicity for it was made, this is a glaring mistake to make; I can't help feel there's a strong case for misrepresentation growing here. As I recall, igneous rocks, like granite, are extremely hardwearing and formed under intense pressure over aeons by the slow crystallisation of molten minerals as the earth cooled, sedimentary rocks also formed under immense (but not intense) pressure by the compression of pre-existing materials, typically on the sea floor. Consequently, sandstones, being far less dense, are; lighter, weaker (crumblier) and very much cheaper than granites. Think to yourselves; "How many people have or want sandstone work surfaces in their kitchens?" I admit I've not been up close and personal with the boulder yet (we really shouldn't call it a rock anymore) and base all my negative observations on the photos supplied here – the smart thing would be to have a good look at it, which I aim to later. So I hope I'm not going to be completely out the ball park on this one, but if I am, it'll be a very public outing! The only good thing I can say about it is that there are people who do genuinely like it, and for them I'm happy, but I can't help feel we've been mightily short-changed, if not to say a little bit conned, by this promise of this project. As a signing-off query, when will the "please do not climb on boulders" (official recognition of the rock's downgrading to boulder status) signs be removed? It's a little ironic as wasn't this one of the main supporting purposes for this installation? Ok. So I guess this is humble pie time for me and I admit I was wrong. I've just been down to the Green, motivated by having written earlier, and I saw first hand the boulder's not sandstone. Sadly also, that's where my apology ends; I approached the Green from Red Path – does anyone know why the signage for that lane is so appallingly awful? It's ancient and hidden behind dense foliage – anyway, when I rounded the top of the hill and got my first view of thing (which is what I think it should be named), I thought… Wow! What an eyesore! It looks so awful. Because it is so very wrong, it is so out of context with its surroundings. You wouldn't take the Mona Lisa out of the Louvre and nail it to the bark of a sequoia in Yellowstone National Park, would you? Or paste a Picasso to the inside pane of phone box, would you? It's all 'art' but it would be just 'wrong'. From a distance, this boulder looks like a giant featureless, concrete lump, which has been unceremoniously dumped in the middle of a lovely grassy meadow. (There's something Arthur C Clarkian about it). Obviously, now that it's here, it's here to stay, so can we please generate some Council or funding interest to provide satellite furnishings around this thing to stop it looking such an oddity? E.g. mini pine trees, a community of park benches – facing outwards from it, incorporated into the outdoor gym, something, anything. I'm hoping other ancillary works are planned for this area of the Green because I have to confess, never in the deepest of my reservations, did I ever consider the final product could be so truly horrible. But in writing this I'm now considering; perhaps the name 'the Thing' is a little unkind, so I'd like to suggest we call it Bob, as an acronym for (Beautify Our Boulder). i BELIEVE SOME LOCAL ARTISTS MAY HAVE ADDED TO THE WORK LAST NIGHT AS THE GRAFFITI SCRUBBERS WERE OUT THIS MORNING. i THOUGHT THE COMMUNITY COULD DO "Anything they liked with it"!!! I had been considering the possibility of the whole thing sinking into the marsh below,this led to considering the footprint left by this particular lump of rock, and on to the carbon footprint, likely considerably more than Stonehenge. "This money will be spent on local projects created by local residents. REAP represents a real and tangible benefit from the 2012 Games for the residents closest to the Olympic Park" says Mayor Pipe. Awwwww come ON all you sad people of Hackney Wick. You've just got a radical & fantastic new boluder to play with - http://www.ukclimbing.com/forums/t.php?t=315787&v=1 ON MABLEY GREEN! Adidas are giving you a brilliant brand spanking new outdoor gym ON MABLEY GREEN! The council are fixing up all those footie pitches ON MABLEY GREEN! What more do you want ON MABLEY GREEN?! I think that at the time of telling you that it was going to be Adidas that were going to build the outdoor gym - it was supposed to be a secret. But now that they're sticking their strapline all over the equipment - I guess the cats out the bag. Still - the gear looks as though it's going to be sturdy & solid - I can't wait to give it a go. I tried out the rock on Sunday & was pleased that it's got some level of difficulty. Actually - it's got an easy route too - so I guess it'll be popular with all levels. Which one is the tennis wall? Is it the last one with the horizontal stripes? If so - it looks a bit small doesn't it? Actually it's quite difficult to tell from that angle - so I should probably reserve judgement until I can get down there. Anyway - I can't wait to start using it. We need so many more of these outdoor gyms all around Hackney. THE HIGHEST CHILDHOOD OBESITY STATS IN THE COUNTRY!!!! Can we not ask Adidas to stick one in the middle of Leabank Square? This is one of those 'chicken & egg' senarios isn't it? We don't get an outdoor gym for free, we get it from a sponsor, but they stick their logo & stripes all over it, thus indoctrinating our kids from such an early age!? This is exactly what we spoke about on http://leabanksquare.blogspot.com/2008/05/macympics.html when fast food companies stuck their filthy ads right in front of our faces for years?! Having said all that - we need many more of these outdoor gyms ALL OVER Hackney. Please can you write to Adidas & beg them for any left over equipment for Leabank Square's green? Let's turn the green into our version of LA's Venice Beach with rippling torso's all out on show for us bored housewives to look out of our windows onto! Oh yes...... Chicken & eggs. Being THE poorest borough in the land simply means that we WILL get sold to - in order to get what other richer boroughs get as a matter of course. Lets just accept that, buy into the system, and beg the sellers for more goodies.